Richard Irwin (Belper, United Kingdom) on 22 April 2008 in Plant & Nature. I was a bit early photographing these, as the flowers were not quite fully out. It's funny how some of these trees are in full flower, and other yet to get started. Beautiful detail and color, Richard. Excellent. You mean it could look more magnificent than this? Impossible! the angle you chose is nothing short of brilliant! Simply beautiful. So very refreshing to look at. Love how you frame things, Richard!! This is so gorgeous with that light filtering through the petals. Great colors, composition and DoF. All those flowers lined up makes for a great image. I think you've caught them at the perfect moment ... 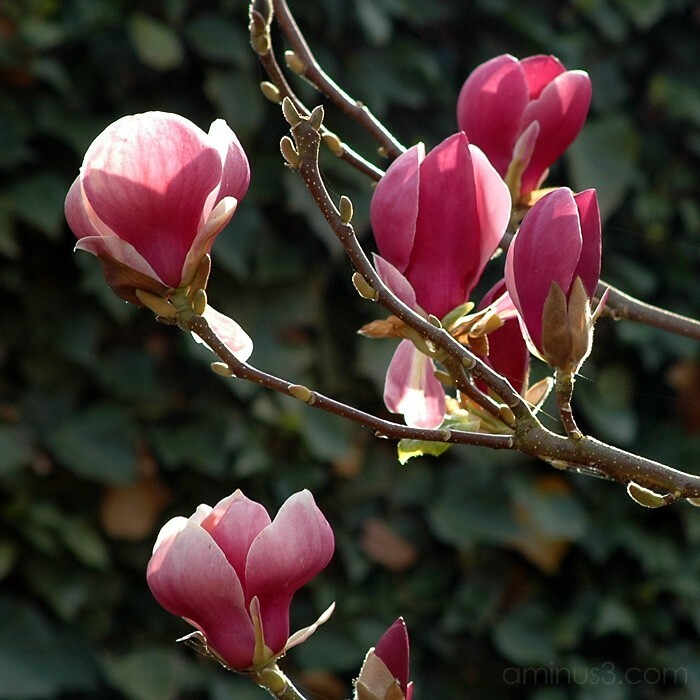 I find that when this variety of magnolia opens fully they lose something. The light and detail, here, is brilliant! Beautiful. Good separation with the background. Lovely crisp shot and great DoF! superb colors. I also like it that the light hits the petals.